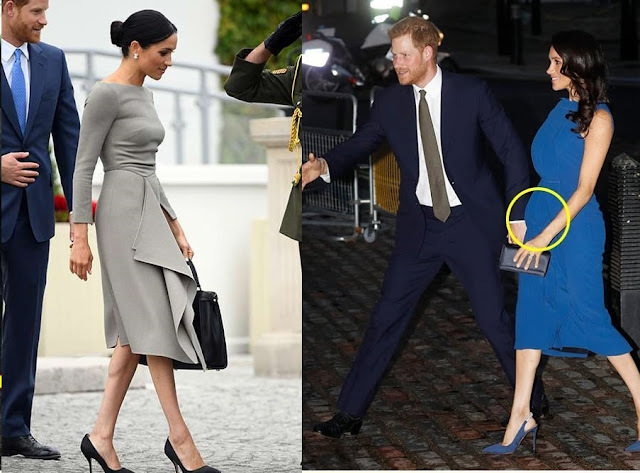 Ever since Meghan Markle announced her pregnancy, people have been analyzing the size of her baby bump, with some even speculating that she might be having twins. Apparently, bump-shaming is a term used to describe the intrusive and often odd remarks and comments people make about a woman pregnancy bump. According to body image expert and therapist Marisa Peer, social media and celebrity culture are to blame for bump shaming. "It’s now the norm to comment publicly on whatever we want, with no regard for how the person on the receiving end may feel," she explains. "Social media makes us feel we’re not only entitled to an opinion, but also justified in sharing it. And it’s now happening not just online, but in real life, too." Every body experiences carrying a baby (or babies) differently, so there's no way to deduce anything about someone's pregnancy just by looking at them. Some baby bumps remain small throughout the process, and some are the size of watermelons by the first trimester. Some people have retroverted uteri, causing their pregnancies to grow backwards and barely show at all. Author and feminist Chimamanda Ngozi Adichie kept her pregnancy to herself to avoid such unsolicited attention, only revealing that she was breastfeeding in a 2016 interview with The Financial Times. Social media and the Internet have made it possible for people to share unsolicited opinions about someone's pregnancy easily and public figures are mostly at the receiving end. Kate Middleton stepped out to greet photographers outside the hospital mere hours after all of her children were born with blown-out hair and heels. Markle probably won't have to deal with strangers in the supermarket touching her bump without permission given her royal security detail, but that wouldn't stop people from "bump shaming" her online.